Twenty hours have passed since national polling precincts closed, after which, the counting of our votes immediately took place. Davao City Mayor Rodrigo Duterte looks to seal the deal in what has been a whirlwind run to the presidency. We've come to terms with the fact that our senatorial slate remains a mixed bag of hits and misses, with the twelve-strong list ranging from sterling leaders (Gordon) and immovable tenants (Drilon), to boxers (Pacquiao) and law-women (De Lima). Alma Moreno (real name Vanessa Lacsamana) has the 24th spot with 2.2 million votes. The drama has passed in these races. However, the same cannot be said about the vice presidential race. Here's a screen-cap of the partial and unofficial results as of 11:40 a.m. You can check out the live results here. It's tight. 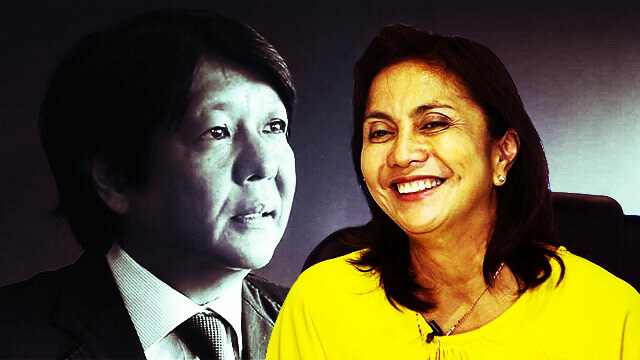 With just 10 percent of untallied numbers remaining and with Camarines Sur Representative Leni Robredo holding a 182,000-vote lead over Senator Bongbong Marcos, this is bound to be a photofinish. When tallying began, Marcos took the early lead and maintained it for a good amount of time. But Robredo had not been far behind. Slowly, her side of the blackboard started getting more chalk. 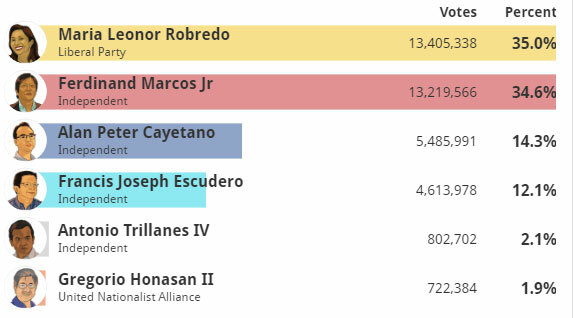 At 4:20 a.m., ABS-CBN reported that Robredo finally overtook Marcos. Team #BBM4VP rose up, with some of them crying foul. People say we should respect the result. The other camp has had some pretty entertaining reactions to the cheating claims. Before the day is over, all votes will have been tallied. 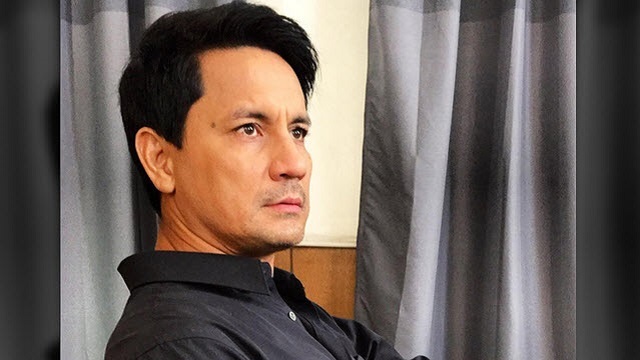 In the meantime, we'll sit back and look at the ongoing battles between the Marcos and Robredo supporters on Twitter. Who'll come out on top? What will the supporters say when all's said and done? Keep checking out these trending hashtags to find out.